Class III Milk and Component prices for March were very positive. Everything but butter and butterfat was up and the butter and butterfat declines were very slight. Class III prices hit $19.40/cwt, the highest since June, 2008. 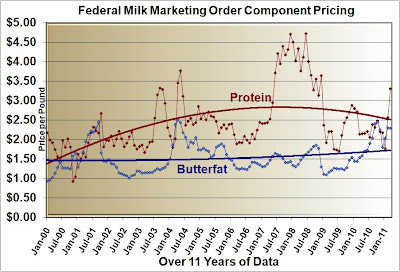 Milk protein hit $3.30/lb., the highest price since October, 2008. 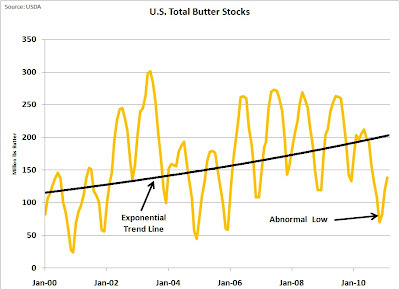 During the month, both cheese and butter inventories moved to more normal levels. 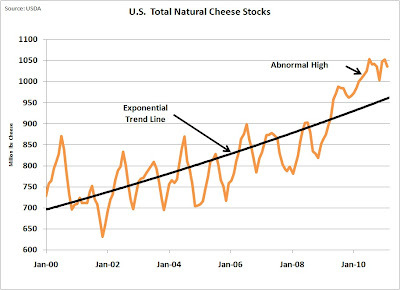 Cheese inventories have been very high and it is not logical for cheese prices to be as high as they were in March in view of the high inventories. 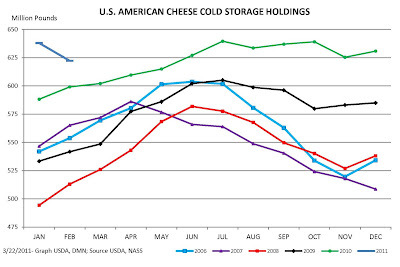 However, the cheese inventories did begin to decline from their high levels which should result in long term firming of cheese prices. 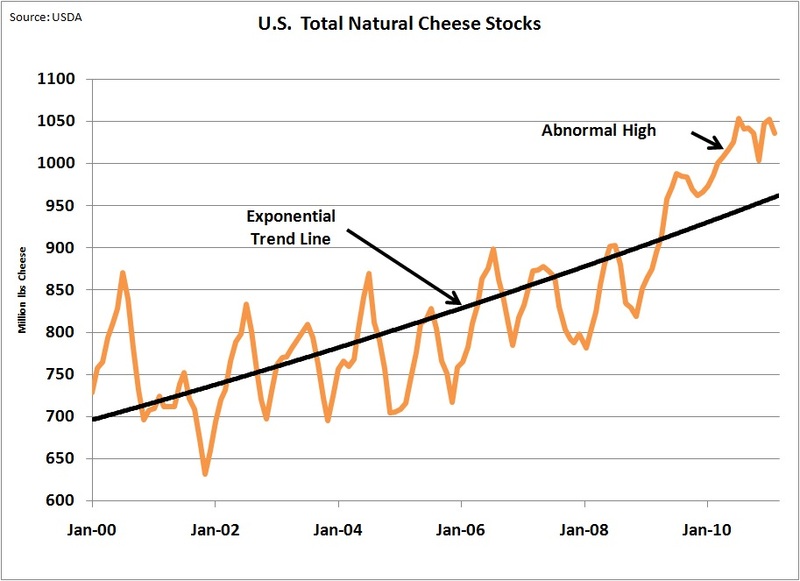 Inventories of both natural cheese and processed American cheese declined in February which is normally a time of increasing stocks. 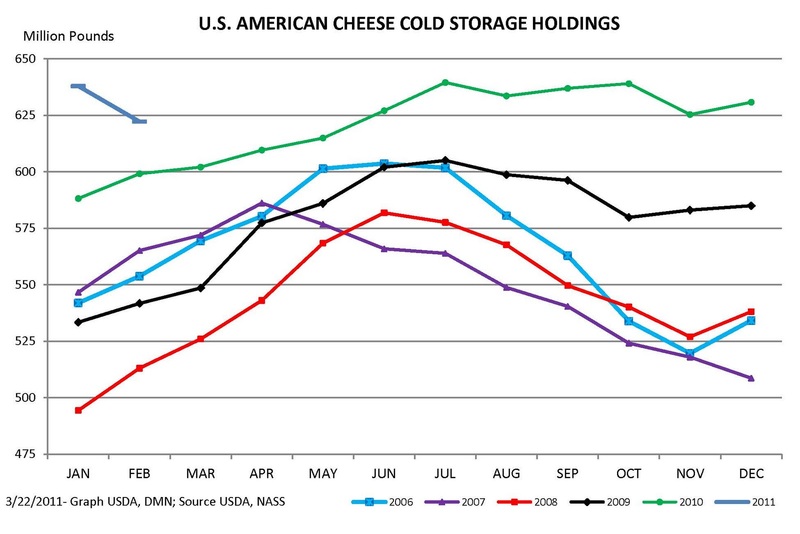 Cheese prices were exceptionally good in March, but they will likely drop a little in the next few months and stay lower until the cheese stocks have further normalized at lower inventory levels. 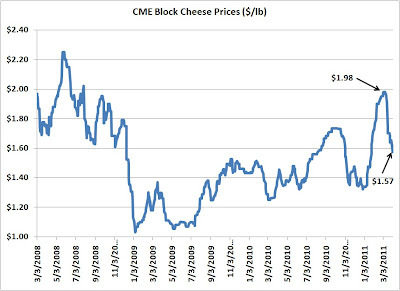 Current CME pricing for cheese is already showing very significant declines (see the last chart in this post). 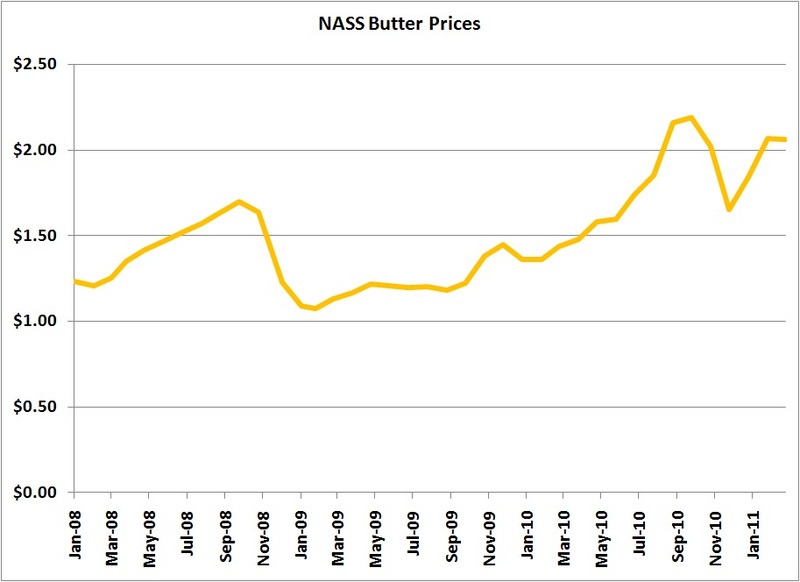 Shown below is the NASS cheese price since January, 2008. 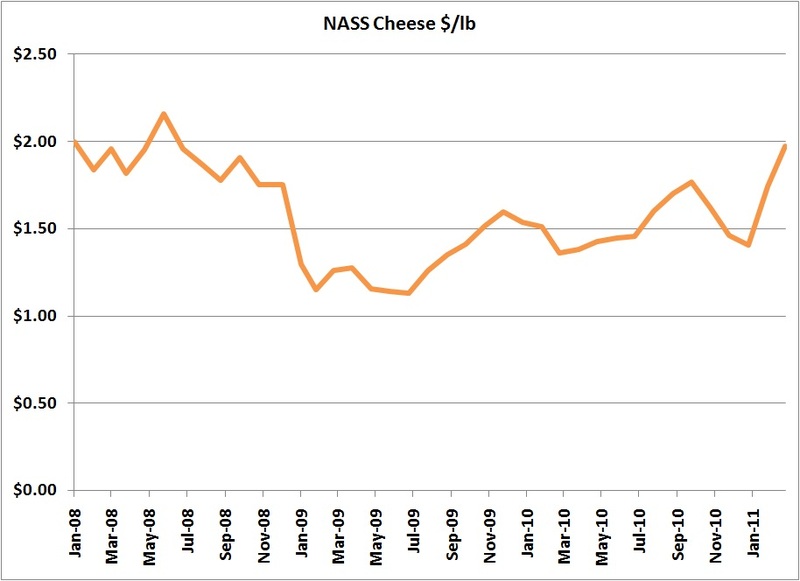 The March NASS cheese price was near historic highs, only 12 cents from the all time high. 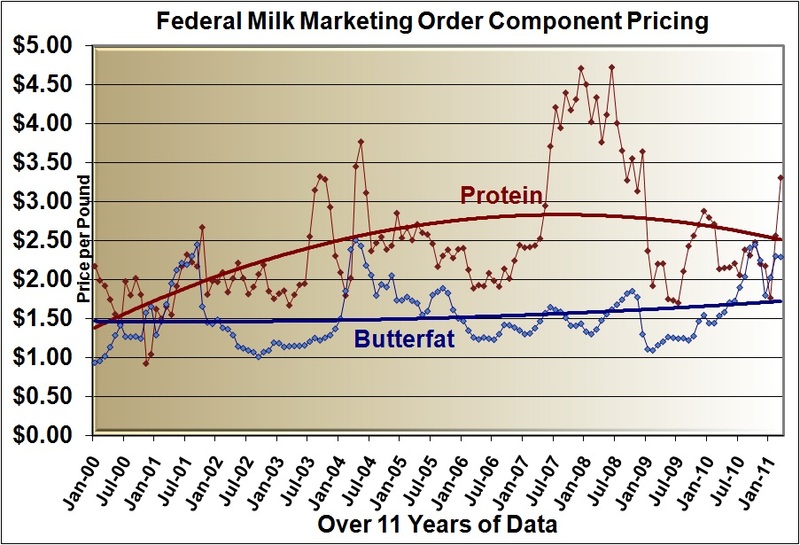 Because milk protein is based on cheese and butter pricing, the current high butter prices have prevented milk protein from reaching 2008 levels. Butter inventories which have been very low for over a year began to show a small recovery in the last two months. 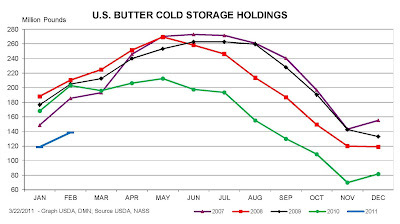 Butter prices have remained high through March, but when inventories recover, they can be expected to fall. 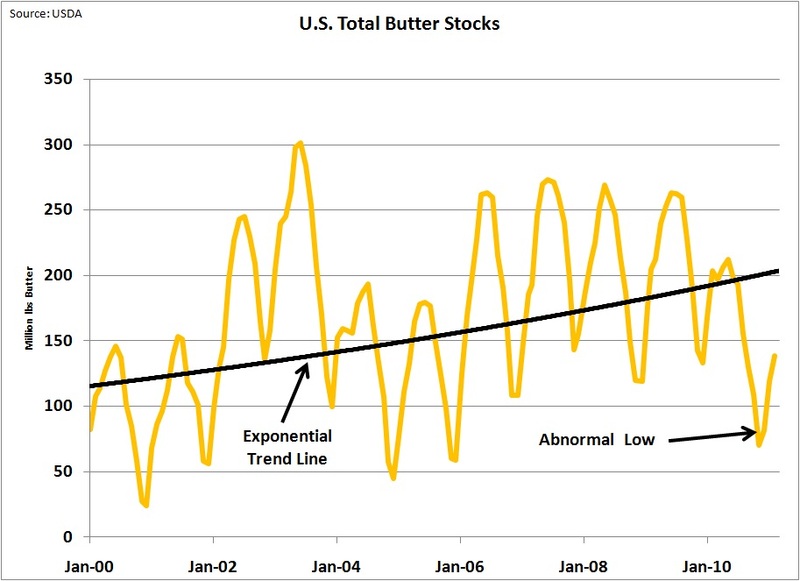 The current inventory level is low enough that a recovery will take many months and high butter and butterfat prices will likely continue through much or all of 2011. What does the rest of 2011 hold? Now we come to the real market dynamics. 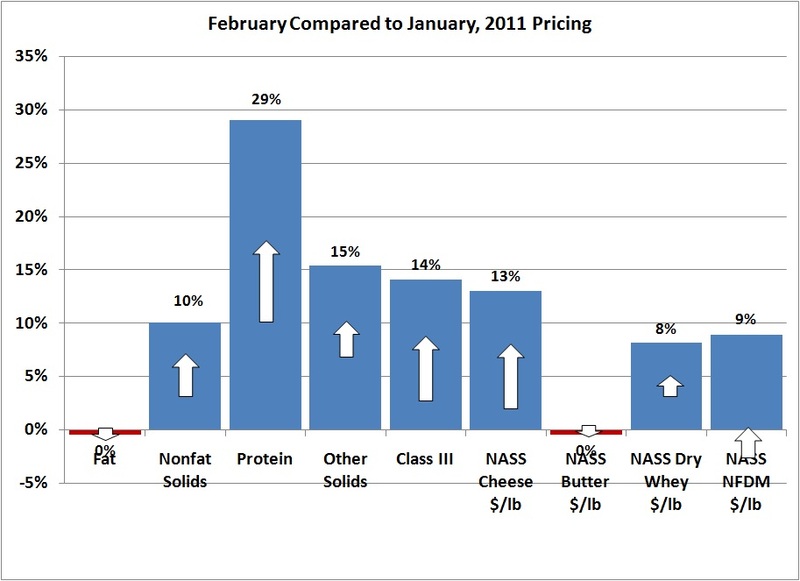 Cheese prices experienced a significant run-up of from February through mid-March. But since mid March, the pricing has started to reverse itself. Futures prices began a sharp decline and cash prices for cheese tumbled from around $2.00 to $1.57. That simply means that while March prices are very high, we can expect a severe decline in cheese and milk prices in April. The Class III price will likely drop to the $16-$17 range in April. 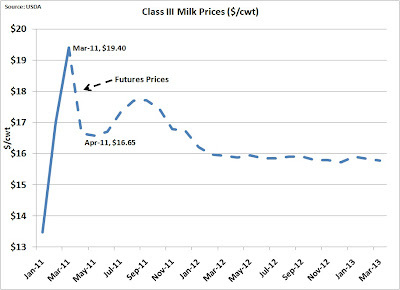 Based on the Class III milk futures market the lower April price level can be expected to continue for the rest of 2011. 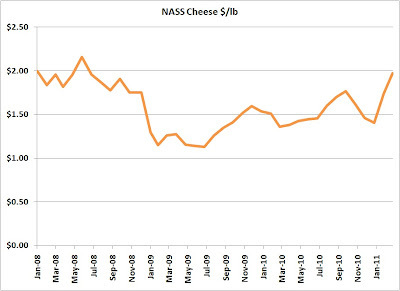 CME cheese prices lead the NASS cheese prices by about 2 weeks and are a very accurate predictor of NASS cheese prices. 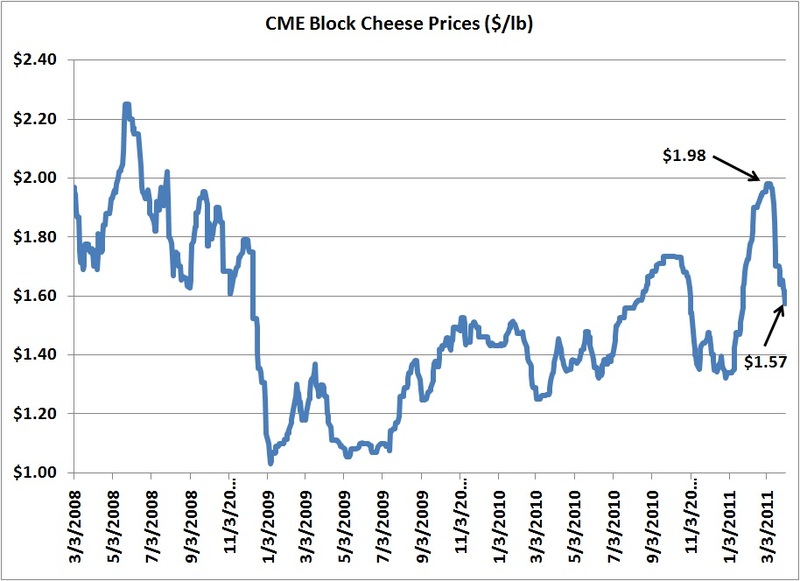 CME cheese prices have fallen from $1.98 to $1.57 in just 3 weeks, so a similar decline in the NASS cheese prices can be expected. 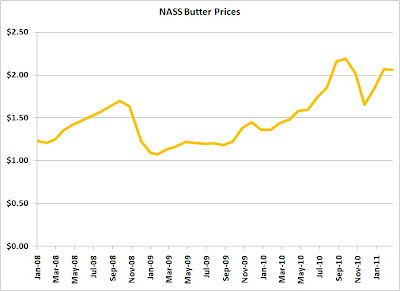 Class III milk prices are calculated based on NASS prices. Enjoy the March milk prices. It looks like they will quickly decline. 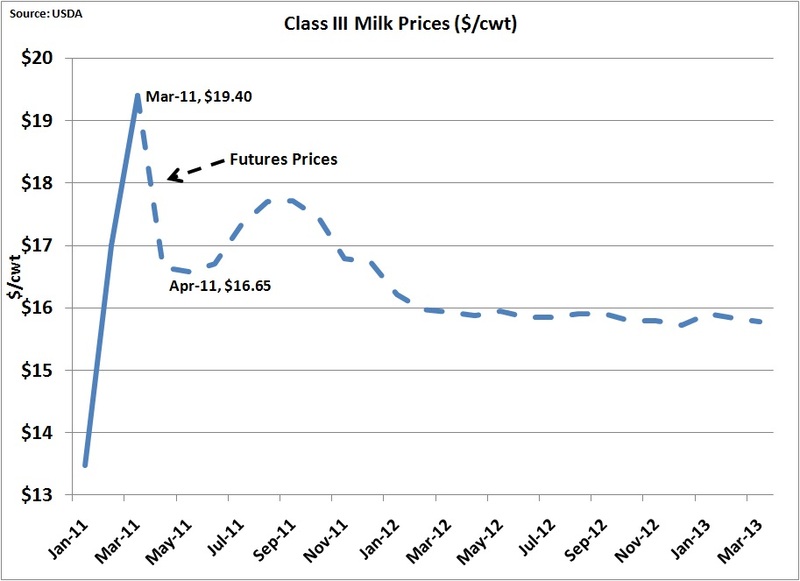 The good news is that the decline will still deliver milk prices at a level well above 2010 prices.